"Charter School" redirects here. For the school in Dulwich, South London, see The Charter School. See also: Category:Education by country. All Australian private schools have received some federal government funding since the 1970s. Since then they have educated approximately 30% of high school students. None of them is a charter school, because they all charge tuition fees. Since 2009, the Government of Western Australia has been trialling the Independent Public School (IPS) Initiative. These public schools have greater autonomy and could be regarded as akin to 'charter' Schools (but the term is not used in Australia). The United Kingdom established grant-maintained schools in England and Wales in 1988. They allowed individual schools that were independent of the local school authority. When they were abolished in 1998, most turned into foundation schools, which are really under their local district authority but still have a high degree of autonomy. Prior to the 2010 general election, there were about 200 academies (publicly funded schools with a significant degree of autonomy) in England. The Academies Act 2010 aims to vastly increase this number. Some private schools in Hong Kong receive government subsidy under the Direct Subsidy Scheme (DSS). DSS schools are free to design their curriculum, select their own students, and charge for tuition. A number of DSS schools were formerly state schools prior to joining the scheme. Charter schools in New Zealand, labelled as Partnership schools | kura hourua , were allowed for after an agreement between the National Party and the ACT Party following the 2011 general election. The controversial legislation passed with a five-vote majority. A small number of charter schools started in 2013 and 2014. All cater for students who have struggled in the normal state school system. Most of the students have issues with drugs, alcohol, poor attendance and achievement. Most of the students are Maori or Pacific Islander. One of the schools is set up as a military academy. One of the schools ran into major difficulties within weeks of starting. It is now being run by an executive manager from Child, Youth and Family, a government social welfare organization, together with a commissioner appointed by the Ministry of Education. 36 organizations have applied to start charter schools. As in Sweden, the publicly funded but privately run charter schools in Norway are named friskoler and was formally instituted in 2003, but dismissed in 2007. Private schools have since medieval times been a part of the education system, and is today consisting of 63 Montessori and 32 Steiner (Waldorf) charter schools, some religious schools and 11 non-governmental funded schools like the Oslo International School, the German School Max Tau and the French School Lycée Français, a total of 195 schools. Unlike their counterparts, laws governing charter schools vary greatly from state to state. In this regard the three states with the highest number of students enrolled in charter schools are California, Arizona, and Michigan. These differences largely relate to what types of public agencies are permitted to authorize the creation of charter schools, whether or not and through what processes private schools can convert to charter schools, and whether or not charter school teachers need to be certified and what that certification consists of. Different states with charter-school legislation have adopted widely different positions in regard to the conversion of private schools to charter schools. California, for example, does not allow the conversion of pre-existing private schools into charter schools. Both Arizona and Michigan allow such conversions, but with different requirements. A private school wishing to convert to a charter school in Michigan, for example, must show that at least 25% of its student population is made up of new students. Legislation in Arizona stipulates that private schools that wish to become charter schools within that state must have admission policies that are fair and non-discriminatory. Also, while Michigan and California require teachers at charter schools to hold state certification, those in Arizona do not. Charter schools were targeted as a major component of the No Child Left Behind Act of 2002. Specifically, the act specifies that students attending schools labeled as under-performing by state standards now have the option to transfer to a different school in the district, whether it is a state, private, or charter school. The act also suggested that if a failing school cannot show adequate yearly progress, it will be designated a charter school. As of 2005 [update] there were almost 100 charter schools in North Carolina, the limit passed by legislation in 1996. The 1996 legislation dictates that there will be no more than five charter schools operating within one school district at any given time. It was passed in order to offer parents options in regard to their children and the school they attend, with most of the cost being covered by tax revenue. After the first several years of permitting charter schools in North Carolina, the authority to grant charters shifted from local boards of education to the State Board of Education. This can also be compared with several other states that have various powers that accept charter school applications. Department of Education Secretary Betsy DeVos espoused “school choice” before accepting the position in President Donald Trump’s administration. School choice refers to spending funds for public charter schools and some private school. DeVos said in a media interview on March 12, 2018, that charter schools can improve the long-established public school system. Betsy DeVos was a campaigner for the American Federation of Children. The National Alliance for Public Charter Schools circulated a research study, “The Health of the Public School Charter Movement: A State by State Analysis.” This report pointed out data regarding the movement’s condition along indicators of quality, progress, and innovation. ^ "Why hedge funds love charter schools". Washington Post. Retrieved 6 November 2016. ^ Sarah Knopp (2008). "Charter schools and the attack on public education". International Socialist Review (62). Retrieved 28 January 2011. ^ "Does Privatization Serve the Public Interest?". Harvard Business Review. 1 November 1991. Retrieved 13 July 2018. ^ a b Brown, Emma (4 February 2015). "Are charter schools public or private?". Washington Post. Retrieved 21 February 2018. ^ "Charter Law Database | National Alliance for Public Charter Schools". www.publiccharters.org. Retrieved 13 July 2018. ^ Ravitch, Diane (8 December 2016). "When Public Goes Private, as Trump Wants: What Happens?". The New York Review of Books. ISSN 0028-7504. Retrieved 14 July 2018. ^ "Here's how our schools are funded — and we promise not to mention Gonski". ABC News. 30 May 2017. Retrieved 14 July 2018. ^ "WA's Independent Public Schools initiative to come under parliamentary microscope". ABC News. 26 February 2016. Retrieved 14 July 2018. ^ "Action on Research and Innovation: The Future of Charter Schools in Alberta" (PDF). Government of Alberta. January 2011. p. 1. Retrieved 24 March 2011. ^ Ritchie, Shawna (January 2010). "Innovation in Action: An Examination of Charter Schools in Alberta" (PDF). the West in Canada Research Series. CanadaWest Foundation. p. 9. Archived from the original (PDF) on 14 July 2011. Retrieved 24 March 2011. ^ "A Primer on Charter Schools". The Fraser Institute. 10 December 2015. Retrieved 18 February 2017. ^ "Charter Schools List" (PDF). Alberta Education. 4 December 2015. Retrieved 18 February 2017. ^ "Charter Schools in Alberta". Alberta Education. Retrieved 4 June 2018. ^ "School Act: Charter Schools Regulation" (PDF). Province of Alberts. p. 8. Retrieved 4 June 2018. ^ "What Pinochet Did for Chile". Hoover Institution. Retrieved 14 July 2018. ^ a b Carnoy, Martin (August 1998). "National Voucher Plans in Chile and Sweden: Did Privatization Reforms Make for Better Education?". Comparative Education Review. 42 (3): 309–337. doi: 10.1086/447510. JSTOR 1189163. ^ "Chile's School Voucher System: Enabling Choice or Perpetuating Social Inequality?". New America. Retrieved 14 July 2018. ^ Larrañaga, Osvaldo (2004). "Competencia y Participación Privada: La experiencia Chilena en Educación". Estudios Públicos. ^ Jarroud, Marianela (11 August 2011). "Chilean student protests point to deep discontent". Retrieved 15 September 2013. ^ Bgcenter. "Colombian Educational Systems". www.bgcenter.com. Retrieved 14 July 2018. ^ "Private education in Colombia". Just Landed. Retrieved 14 July 2018. ^ "Grant Maintained Schools Database". The National Digital Archive of Datasets. The National Archives. Retrieved 14 February 2010. ^ "Q&A: Academies and free schools". BBC News Online. 26 May 2010. ^ "Germany: Basic Law for the Federal Republic of Germany". www.wipo.int. Retrieved 14 July 2018. ^ "Finanzen der Schulen - Schulen in freier Trägerschaft und Schulen des Gesundheitswesens" (PDF). Statistisches Bundesamt. 14 June 2012. Retrieved 1 July 2012. ^ "German Higher Education Entrance Qualification - Abitur - Study in Germany for Free". Study in Germany for Free. 22 July 2016. Retrieved 14 July 2018. ^ "Two-thirds of Hong Kong's direct subsidy scheme schools raise fees". South China Morning Post. Retrieved 14 July 2018. ^ Zealand, Education in New. "Partnership Schools | Kura Hourua (Charter Schools)". Education in New Zealand. Retrieved 14 July 2018. ^ "Elevar i grunnskolen, 1. oktober 2015". Retrieved 28 August 2016. ^ Fisman, Ray (15 July 2014). "Sweden's School Choice Disaster". Slate. ISSN 1091-2339. Retrieved 14 July 2018. ^ "The Swedish model". The Economist. 12 June 2008. ^ Buonadonna, Paola (26 June 2008). "Free schools". BBC News Online. ^ DiMassa, Cara Mia. " 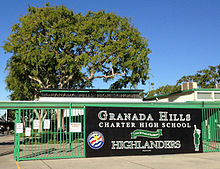 Granada Hills Gets Charter OK." Los Angeles Times. 14 May 2003. Retrieved 8 January 2016. ^ "50-State Comparison: Charter School Policies". www.ecs.org. ^ "Minnesota Charter Schools". 2015. Archived from the original on 26 August 2011. Retrieved 4 February 2016. ^ Zinsmeister, Karl. (Spring 2014). "From Promising to Proven: The charter school boom ahead". Philanthropy Magazine. ^ National Center for Education Statistics (2016). "Charter School Fast Facts". ^ Education Digest (2014). "Number and enrollment of public elementary and secondary schools, by school level, type, and charter and magnet". ^ Vallas wants no return to old ways. The Times-Picayune (New Orleans). 25 July 2009. ^ RSD looks at making charters pay rent, The Times-Picayune, 18 December 2009. ^ Powers, Jeanne M. "Charter Schools." Encyclopedia of the Social and Cultural Foundations of Education. 2008. SAGE Publications. 5 December 2011. ^ Premack, Eric. "Charter schools: California's education reform 'power tool. '(Special Section on Charter Schools)." Phi Delta Kappan 78.1 (1996): 60+. Academic OneFile. Web. 5 December 2011. ^ Lacireno-Paquet, Natalie. "Moving Forward or Sliding Backward: The Evolution of Charter School Policies in Michigan and the District of Columbia." Educational policy (Los Altos, Calif.). 21. (2007): 202. Web. 5 December 2011. <Educational policy (Los Altos, Calif.)>. ^ US Department of Education (7 November 2004). "Questions and Answers on No Child Left Behind...Charter Schools". ^ Knight, Meghan. "Cyber Charter Schools: An Analysis of North Carolina's Current Charter School Legislation." North Carolina journal of law . 6. (2005): 395. Web. 6 December 2011. http://heinonline.org/HOL/Page?handle=hein.journals/ncjl6. ^ Sarah R. Cohodes; Elizabeth M. Setren; Christopher R. Walters; Joshua D. Angrist; Parag A. Pathak (October 2013). "Charter School Demand and Effectiveness" (PDF). ^ a b c d e f Barkovich, David (2014). A Study of College Admission Officers' Attitudes and Perceptions About Cyber-Charter High School Applicants (doctoral dissertation). pp. 2–136 – via ProQuest. Estimations of K-12 online learners in 2000-2001 placed the enrollment nationally at 40- 50,000 students (Clark, 2000) while just a year later The Peak Group (2002) placed the number at 180,000. ^ Coughlan, Sean (4 November 2015). "Online schools 'worse than traditional teachers'". BBC News Online. Retrieved 4 November 2015. ^ "Charter vs public school: What's the difference?". WTLV. Retrieved 4 June 2018. ^ "Charter Schools". NEA. Retrieved 4 June 2018. ^ "Charter Schools vs. Traditional Public Schools: Which One is Under-Performing? | PublicSchoolReview.com". PublicSchoolReview.com. Retrieved 4 June 2018. ^ Brown, Elisha (12 March 2018). "Betsy DeVos Says Charter Schools Make Public Schools Better. Her Home State Shows That's Not True". The Daily Beast. Retrieved 4 June 2018.